Their latest album, Reliquary For a Dreamed Of World has already received a big thumbs up from Aural Aggravation. To coincide with the release, the band, known for their mind-melting visuals, celebrate video nasties in their brand new official video for ‘Milk Of Amnesia’. Here’s what Adam Richardson had to say about it… “The video for ‘Milk of Amnesia’ is a visual banquet to serve the song…. 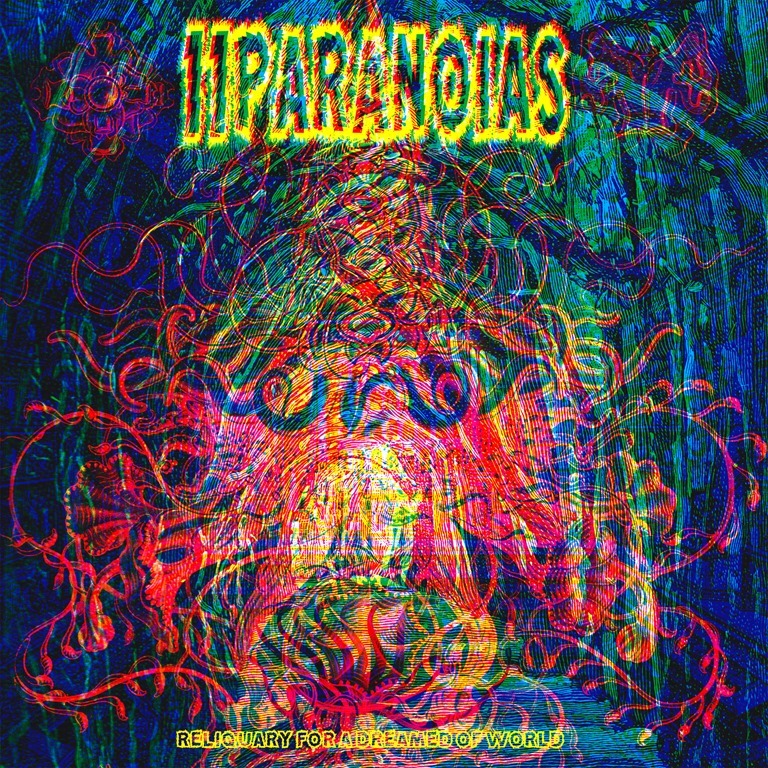 it is a psych rock anthem with black metal delivery and aesthetic – wildly different to any other song on the album… so we have used appropriately toned low-budget horror film clips as well as the intense psychedelia of drug drenched visions to act as an accompanying bludgeon to what is the shortest song we have ever recorded (under 4mins)”. 11Paranoias do heavy psychedelic with the emphasis very much on the heavy. Their fourth album, Reliquary For A Dreamed Of World is a downtuned, ultra-low frequency, mega low-tempo doom sludge trudge through the darkest places of psychedelia. The crushing riff that lands halfway through ‘Peripheral Metamorphosis,’ the album’s first track, registers around the same sonic zone as Swans’ ‘Cop’. There’s an eternity between each pulverizing drum smash, which lands with the force of a planetary collision, and the power-chords are heavier than is conceivable for mere instruments to make: this is music that’s nothing short of galactic in its enormity and weight. It’s the sound of dark matter combusting. Five minutes into the 15-minute mammoth that is ‘Destroying Eyes’, a whip-crack treble-topped snare snaps through the dense murk of noise to propel a vocal track, layered in delay and reverb to plough a New-Wave inspired furrow before it all explodes, unexpectedly, in a blistering wig-out centres around a driving goth-tinged groove. After the hypnotic ‘Avallaunius’ chills the intensity – at least for the first three minutes or so, at which point it brings the noise – ‘Mutus Liber’ brings it low and slow and goes for the crushingly heavy in a big way, the mangled vocals all but lost in the tsunami of immense power chords. ‘Meditation on the Void’ is the darkly hypnotic workout the title suggests, whipping up a cyclone of psychedelia which threatens to collapse in on itself. After the slowly spiralling ‘Phantom Pyramid’, the brevity of the final track, ‘Milk of Amnesia’ is unexpected. In fact, a squalling barrage of feedback a snarling, ripping bass from which emerges something that for all the world resembles a distorted segment of Fields of the Nephilim’s cover of Roxy Music’s ‘In Every Dream Home a Heartache’, it’s unexpected in pretty much every way imaginable. Conjuring mental spaces and a hallucinogenic, mirage-filled alternative reality, Reliquary For A Dreamed Of World conjures a world that’s s much a nightmare as a dream. It’s a powerful album which, while heavy – and oftentimes, monumentally so – displays a remarkable knack for a deep groove. It’s an album that will bend your brain, while crushing it by sheer force at the same time.